MANILA, Philippines – Korean stars have not only helped in boosting the popularity of Korean music and dramas but have driven up the sales of Korean cosmetics. Quoting government agency Statistics Korea, media said sales of cosmetics in Korea last year ballooned to 10.82 trillion won (P409 billion), an increase of 9.6 percent from 2010. In addition, export of Korean cosmetics increased to $761 million (P32.30 billion) in 2010, according to the Korea Cosmetic Association. The increase in sales of Korean cosmetics is a result of the increase of the number of tourists visiting Korea, the increase in demand from Korean consumers and the Korean wave. Cosmetic companies hire Korean stars as their endorsers to boost sales. 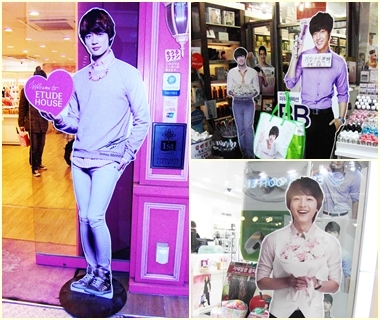 A visit by Bulletin Entertainment to Myeongdong and other shopping districts in Seoul recently showed cosmetics stores displaying life-size photos of Korean stars to attract tourists and local consumers. Singer Kim Hyun Joong, for example, is the endorser of The Face Shop and his image is displayed in all the stores in Seoul. Nature Republic has boy band JYJ, singer and actor Jang Geun Suk and KARA member Goo Hara as endorsers. Etude House has Sandara Park of 2NE1 and boy band SHINee. The Saem has Lee Seung Gi and After School. It’s Skin got 2PM’s Nichkhun as endorser while Tony Moly has actor Song Joong Ki and girl group T-ara. Clothing companies also use Korean stars to endorse their products. These Korean stars form part of the current hallyu boom that is spreading in Asia and in different regions.